This weekend it’s that time again, when “Kreuzberg’s” streets are filled with dancing people and various culture acts. Because form the 6th till the 9th of June Berlin hosts the “Karneval der Kulturen”. Every year people from all the different cultures in Berlin get together and arrange this big and fantastic event. Music and dance groups, professional and amateurs, children and adults take part in the parade through Kreuzberg. From anarchic performance over traditional dances to mash-up and remix; from high- to popular-, in “Karneval der Kulturen” culture has many meanings. And that is what makes this Karneval so special. Since 1996, thats the first year the Carnival was hold, the event is constantly growing. It has grown form 50.000 visitors to more than a million today. The number of participants in the parades, however, rose steadily, from about 2,200 to over 4,000 actors. The originality and imagination of their performances and equipment is awarded with prices. The Parade will take place on Sunday the 8th. It will start 12:30pm at u-Bahn “Hermannplatz”. Also, this year is the first year, that the famous Club Ritter Butzke will have a wagon at the Parade. 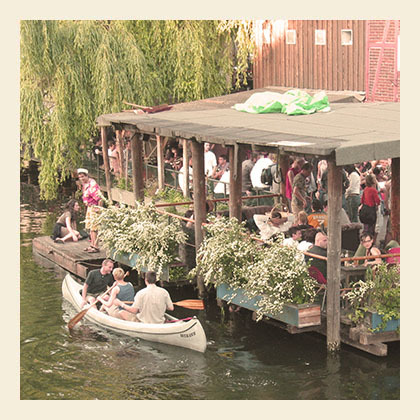 The project of the RitterButzke is more than just a club in Kreuzberg backyard aqua Carree. It is a meeting point for enthusiastic idealists and hedonists creative. With a focus on electronic music is here always tried to celebrate the new musical break with a variety of genres. Hopefully their wagon will be quite as crazy, playful and multi-faceted as the debauched late nights at the club. If you need to know how to get to the Carnival, just come and ask us at the reception. The official Aftershowparty will be at “Yaam” this year. Yaam is a Reggae Beach Club near Osthahnhof.